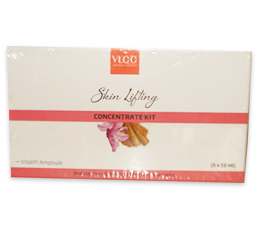 Buy VLCC Skin Lifting Concentrate Kit Reduces the appearance of fine lines & Wrinkles. VLCC Skin Care Products Online. Vitalift Ampoule Prevents recurrence of pimples. Improves skin texture. Long lasting firmness and resilience. Reaffirming, tightening and uplifting actions. Cools & soothes the skin, Reduces wrinkles,fine lines & other signs of anti ageing. Imparts instant natural glow to the face. Instant brightness & radiance. Regulates excess oil secretion. Cleans clogged pores. Use mix 4-6 drops of Vitalift with Lime Massage gel and massage all over face and neck.